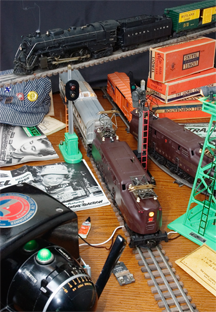 Postwar toy Lionel trains and accessories. Between 1900 and the late 1950s, Lionel toy trains were the leading toy trains in the United States. But by the late 1960s, though still retaining leadership in toy trains, Lionel, and the market, were in full decline. Entering bankruptcy in 1967, Lionel sold its product dies and eventually its brand name. This story of decline in some ways paralleled the decline of U.S. passenger railroads, to which it was probably linked. Certainly management issues were a factor, but the decline of U.S. passenger rail was likely the underlying cause of Lionel's decline. However mightily Lionel employees at the time strived to save the company, there was little they could do, given management's failure to find a survival strategy. Many employees today are in analogous situations, but probably few realize the full scope of the threat. Photo (cc) Joe Schneid, Louisville, Kentucky. Imagine working in a very poorly run organization. Suppose it's losing market share, management doesn't deal with incompetents, backstabbing is rife, or supervisors use performance reviews as tools of abuse. Problems are so prevalent that good people leave. If they can't leave, they give up and wait until they can. Vanished long ago is the pride you once took in outstanding performance. Now, each day provides a fresh stream of frustrations as you try to work around behavioral or procedural obstacles. It's beyond physically tiring. Your soul is tired. But sleep doesn't come easily. When morning mercifully ends another difficult night, another difficult day begins. Weekends once provided relief, but six months ago, your boss started expecting six-day weeks "just for the time being." You don't know when that might end, if ever. It's all so fixable, if only they would replace this supervisor or that, terminate these people or those, get a new marketing VP who knows something about marketing, or a CEO who can actually spell "CEO." Or cancel those three projects, which everyone knew were wrongheaded at the start and which are now consuming resources so badly needed elsewhere. Then one day, you suddenly realize that fixing this mess is just not your job. It isn't your job to determine who should be terminated, or whether a new is CEO is needed, or how to manipulate some slacker who doesn't even report to you, into doing something constructive that might help unblock you. You realize that if you can't work because others refuse to work, your responsibility ends. At first you feel relief, but relief turns to uneasiness, as you ask yourself, "Where does my responsibility end? Is it OK to do nothing just because someone else is doing nothing?" It's a puzzle, but it has a solution. Here are three guidelines to help you find the limits of your responsibility. It's difficult to know where your responsibility ends if your own job description is unclear. Review your job description with your supervisor to clarify it or to align it with your actual job. your direct reportsjob to correct substandard performance on the part of people who aren't your direct reports. If the performance in question affects your own efforts, consider reporting it to your own supervisor or to the responsible supervisor. Occasionally you might be asked to cover for someone who's temporarily unavailable. That's fine on a short-term basis, for a defined interval. But it isn't your job to do other people's jobs unbidden or indefinitely. Learn to let that go. Would you like to see your comments posted here? rbrencUikVDoFJtVDkSZrner@ChacgUwAhRzYcXfUfUiwoCanyon.comSend me your comments by email, or by Web form. I offer email and telephone coaching at both corporate and individual rates. Contact Rick for details at rbrencpOVnjFQFLTirRxvner@ChacSQwZDLzBJkKfDwkEoCanyon.com or (650) 787-6475, or toll-free in the continental US at (866) 378-5470.